St. Monica's Tears~A Feast Day Treat! Happy Feast of St. Monica! St. Monica is the perfect model for perseverance. She never gave up prayers for her wayward son. (St. Augustine) Begging God for his conversion, she cried many tears. Legend says that a drain formed in the ground where her tears fell while she prayed for her son. When she approached her local bishop to ask him to help win over her son to the faith, the Bishop consoled her by saying: "God's time will come. Go now, it is not possible that the son of so many tears should perish." The good news is that Monica never gave up and her son's heart was turned away from his evil ways. Augustine later became know for his famous conversion and became "St." Augustine after his death, one of the greatest saints and doctors of the Catholic Church. St. Monica's life was a message of hope. Her tears gave way to God's sweet grace and bountiful blessings! These teardrop treats represent St. Monica's tears that were "sweetened" by the sweat of her prayers. Break apart crescent dough into triangles. Spread a small amount (approx. 1-2 teaspoons) of Nutella or favorite spread on the top end of the triangle only. A little bit goes a long way...Otherwise the chocolate will leak all over! Roll dough from the larger end down to the smaller end as if making a croissant. Then, fold the two ends inward to form the shape of a teardrop. Pinch the ends together to increase the chances of holding the teardrop shape. Here are before and after photos. Remember that the dough will rise/puff up a little bit so try to elongate the ends as much as possible. Intercede for us, dear St. Monica, example for Christian motherhood, hope, and perseverance! The "Arnold Palmer" drink is a mix of half tea and half lemonade served chilled over ice. It is also called half-and-half. It is one of our family's favorite drinks, especially in the summertime. I came across a honey sweetened version on the National Honey Board Website. The inclusion of honey seemed a natural to add to the mid-August feast of St. Bernard of Clairvaux, as he is a patron of bees and beekeepers. There are other beekeeper patron saints but this one falling on August 20, seems particularly fitting since this time of year we are looking for ways to beat the summer heat and add refreshment. Combine ingredients in sauce pan over low heat. Stir until dissolved. Cool. Mix honey-lemon mixture with 4 parts tea for the half and half. Add more tea or water to taste. Stir, refrigerate, and serve over ice. May need to stir again while drinking as honey settles to bottom if left too long. Garnish with lemon or mint if desired. Relax. Enjoy. ETA: Apparently, August 20 is also National Lemonade Day - I had no idea. How convenient to have suggested a lemonade drink already. The honey-lemon/lemonade portion of this recipe is very tasty on its own and I recommend it as well. 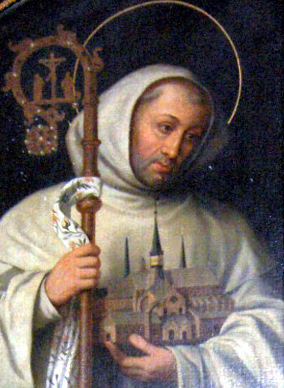 St. Bernard (August 20), mystic and Doctor of the Church, was a main propagator of the Cistercian reform and the founding abbot of Clairvaux Abbey in Burgundy. He was born in Fontaines-les-Dijon, France in 1090. Dijon is the capital of the Burgundy region in France. The region is world famous for its Burgundy wine and its mustard. It had become a recognized center for mustard making by the 13th century. The creation of Dijon mustard as we know it is credited to Jean Naigeon, who revolutionized the original mustard recipe by substituting verjuice (the sour juice of unripe grapes) for the vinegar traditionally used in the making of mustard. This resulted less acidic mustard with a smother flavor. To make Dijon mustard, ground black or brown mustard seeds are pressed and steeped in verjuice, or more recently in white wine. At one time, any product called Dijon mustard had to be made in the Dijon region of France. Other products could be called "Dijon-style mustard" or simply "dijon mustard" with a lowercase "D". Today, however, the term Dijon mustard has become generic, so any mustard using the basic Dijon recipe can be called Dijon mustard. Our family has a Dijon mustard based chicken recipe that has been a favorite for 30 years. It seems a fitting feast day meal for the eminent St. Bernard who hails from the Dijon area. Melt butter in small saucepan with minced garlic. After garlic has sautéed, add mustard and mix. Let cool and whisk mixture to combine until creamy. Mix bread crumbs, parmesan cheese, and parsley in shallow bowl or pan. Dip chicken into butter/mustard mixture, then dip in bread crumb mixture to coat both sides. Place in glass 9x13 pan. Bake uncovered 25 - 30 minutes, until juice of chicken is no longer pink when centers of thickest pieces are cut. St. Bernard of Clairvaux is the author of the Marian prayer, The Memorare, which you may want add to your feast day meal prayer. I first learned about this obscure, to me, saint when we visited Spain a couple years ago. In the Basque region, near my relatives' town, there is a cave containing prehistoric paintings – Santimamiñe Cave. These cave paintings date from about 13,000 BC and include a range of animals such as bison, horses, deer, goats and brown bears. The cave's name comes from a nearby chapel of Santimamiñe, which in the Basque language means San Mamés or St. Mamas (also St. Mammes), to whom the chapel is dedicated. I had not heard of him before, but the guide shared that he was a 3rd century martyr, often pictured with a lion. He was orphaned at a young age – his parents killed for being Christians. He was a shepherd who was known to preach to the animals in the fields. It is told that St. Mamas was tortured for his faith by the governor of Caesarea and was then sent before the Roman Emperor Aurelian, who tortured him again. An angel then freed him and ordered him to hide himself on a mountain near Caesarea. 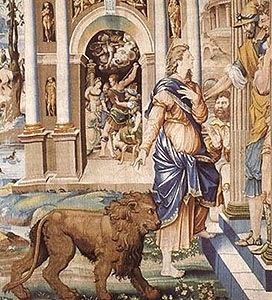 St. Mamas was later thrown to the lions, but managed to make the beasts docile. A lion is said to have remained with him as companion and protector. Accompanied by the lion, he visited Duke Alexander, who condemned him to death. In Cyprus, there is the legend that he was a hermit and when soldiers were sent out and captured him, while on the way back to town, St. Mamas saw a lion attacking a lamb, escaped the soldiers, saved the lamb, jumped on the lion's back, and rode it into town. That is how he is often depicted in icons. He is the patron of Langres; babies who are breastfeeding; protector of sufferers from broken bones and hernias. Pilgrims on their way to Santiago de Compostela brought his cult into Spain and he is more well known there. A statue depicting San Mamés and a lion can be found in the Casa de la Misericordia in Bilbao, which was once the convent of San Mamés and whose current chapel holds a relic of the saint. The stadium that is home to the Athletic Club de Bilbao is called San Mamés Stadium, and players of that club are called the "lions of San Mamés" because their stadium was built near there. So his feast day (August 17) can be a time to learn a little more about a saint that might be new to your family, too. 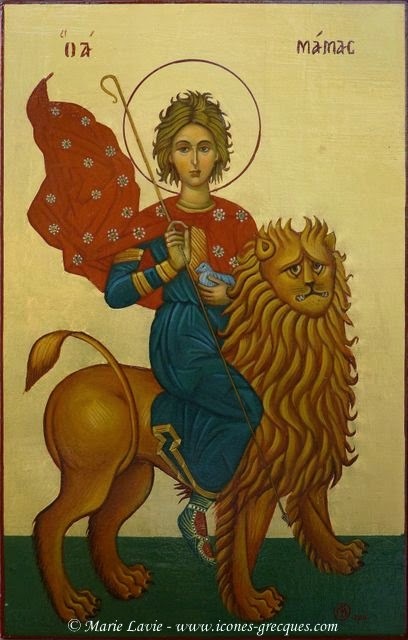 Since St. Mamas is closely associated in pictures with a lion it is a feast day idea. Additionally, it was a medieval belief that the lion slept with its eyes open. For this reason, they also became a symbol of watchfulness. I came across this lion themed recipe and thought it would be a fun, savory lunch idea for children to add the the other lion themed recipes on Catholic Cuisine. It is made from spiral noodles in a red sauce, surrounding a circle of colby jack cheese. Add olives for the eyes and nose, with cheese triangle ears and pepperoni strip whiskers. Who can resist a pasta lion? Other saints who are depicted with a lion are St. Mark, St. Jerome, St. Mary of Egypt, St. Paul the Hermit, St. Ignatius of Antioch, St. Onuphrius, so this idea could be used at other feast days. Infusing your water with fruits, herbs, or veggies not only adds flavor to the water, but also adds essential vitamins and nutrients that help your body. It is a great way to quench your thirst and keep you hydrated on a hot, late summer day. They can be helpful for getting children to increase their daily water intake. And they are pretty, too. Making your own is more cost friendly and healthier than purchased waters. So join in making some feast day themed waters with a hint of summer flavors for our August saints. Making infused water is very simple. Just add desired fruit, veggie, or herb or combination to a pitcher of water with ice. Muddle mixture a bit if you want to increase flavor and let steep for at least several hours, up to 24, depending on how strong you want the flavors. For some mixtures you can pour directly from pitcher, for others you may want to strain ingredients first to remove small floaters. As long as you keep the water refrigerated, the fruit should stay fresh. And you can keep refilling the pitcher as you drink the water but, it will dilute the flavor each time you refill. It should last several days before you need to remake with fresh fruit. One way to make infused water is with a single ingredient. Citrus is a great, no lose option for adding a touch of flavor to water, so it can be a good one to start with. In her recent post for Catholic Culture, Jenn Miller alerted me to the connection of St. Dominic (August 8) to the orange. So orange infused water would be perfect for his feast day. You can also make infused waters that combine a variety of fruits, veggies or herbs. Infused waters are simple, no frills refreshers and considering that St. Maximilian Kolbe (August 14) died in a concentration camp it is a simple, non-extravagant treat for an austere remembrance. St. Maximilian had a vision of Mary – she offered him two crowns – red for martyrdom and white for purity and asked which one he would accept. He chose both. Making a coconut strawberry infusion represents the colors of the two crowns that he was shown and accepted. Blueberry orange infused water incorporates blue for his Marian devotion and formation of the Militia of the Immaculata movement of Marian consecration. Orange trees and their blossoms are symbolic of purity, chastity and generosity so the addition of oranges for St. Maximilian represents three strong characteristics of this saint who gave his life to take the place of another prisoner. As mentioned since blue is a universal color associated with Mary, the blueberry is a great fruit to use on Marian feasts. The lemon is a symbol of fidelity in love, and, as such, is often associated with the Virgin Mary in art. A lemon blueberry infused water would be a refreshing addition to this Marian solemnity. The rose is closely associated as a symbol for St. Rose of Lima (August 23) but could be used, too, for St. Clare (August 11) as she has a rose story. The vanilla bean and raspberries of this recipe don't necessarily represent anything about the saints but were a infused water combination I found with rose that sounds delicious.